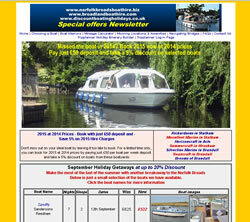 To read more, just click the image of one of the newsletters. There were 20% discounts to be had for bookings in the month of September. 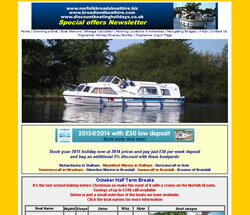 We highlighted a new feature of the site - the facility to compare Norfolk Broads boats of the same design. 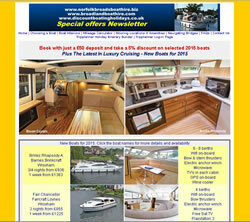 You are now able to see whether a comparable boat had extra facilities, perhaps bow thrusters or 240 volts onboard together with an indication as to whether the alternative was cheaper than your original choice. 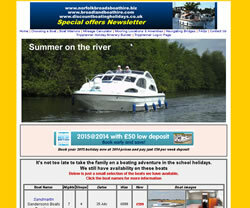 We were telling you that the early weeks of the summer school holidays were already a sell-out and perhaps think about booking early for 2015 if you wanted a specific boat over the children's school holidays. We highlighted a way of printing our town and village maps showing moorings spots, public houses, shops etc so that they could be taken on holiday with you. If you wanted live music whilst on holiday, you could do worse than follow our guide to what's on which detailed 2 music festivals in August and 1 in September. We highlighted that the fishing season had opened again on the 16th June to the delight of the hundreds of anglers who were lining the rivers on that first day. Hair straighteners and would they operate on a Norfolk Broads boat was the question. The answer was not so straight forward though!. 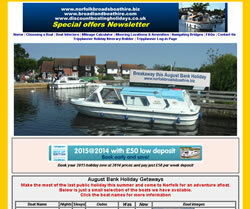 Our live music on the Norfolk Broads guide was updated to include the months of July and August.